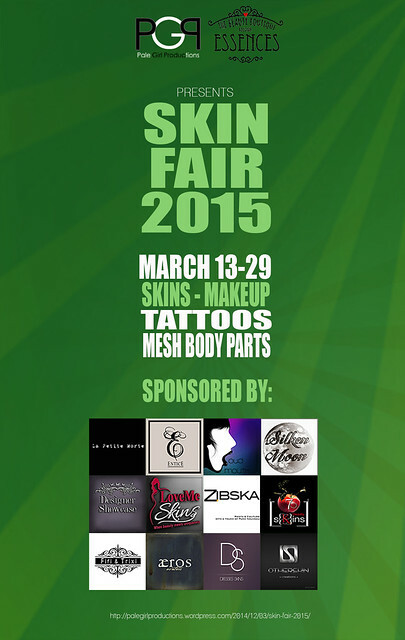 Skin Fair 2015 is brought to you by Pale Girl Productions and Essences. Opening March 13th. Applications are currently closed, however if you would like to apply for the wait list please click here. Reblogged this on The Anti Girly Girl Blog. Pingback: Skin Fair 2015 (Post-185239) - [O.L.D.] Old London Docks - Best Second Life Fashion and Lifestyle Blog Feeds! Pingback: Awakening - A Skin Fair 2015 Preview (Post-188836) - [O.L.D.] Old London Docks - Best Second Life Fashion and Lifestyle Blog Feeds! Pingback: Look #20 (Post-188959) - [O.L.D.] Old London Docks - Best Second Life Fashion and Lifestyle Blog Feeds! Pingback: Shaedynlee – Skin Fair 2015 Coming Up! Pingback: Skin Fair 2015 – Zoul Creations (Post-189278) - [O.L.D.] Old London Docks - Best Second Life Fashion and Lifestyle Blog Feeds! Pingback: Romy (Post-189900) - [O.L.D.] Old London Docks - Best Second Life Fashion and Lifestyle Blog Feeds! Pingback: Shaedynlee – Aeryn the Lovely..
Pingback: Look #21 (Post-190332) - [O.L.D.] Old London Docks - Best Second Life Fashion and Lifestyle Blog Feeds! Pingback: . ::WoW Skins::. Ilenia – Skin Fair 2015 (Post-190451) - [O.L.D.] Old London Docks - Best Second Life Fashion and Lifestyle Blog Feeds!